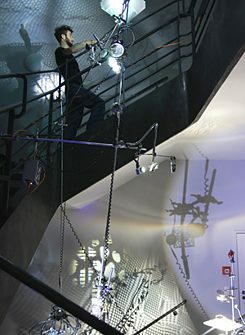 Inspired by the concept of extended cinema, based on art history, the RaumZeitPiraten created a conglomerate of optoacoustic devices and machines, installed at the Goethe-Institut Montreal on the occasion of the Nuit Blanche 2019, transforming the space and its architectural properties into a walkable audiovisual network. What was historically a cinema experience became a futuristic and interactive experimentation place that, instead of presenting the illusion of a project for the future, transformed the passive observer into an active element in a space of possibilities. "This transition [...] is about the leap from the historical, evaluative, political consciousness into a cybernetic, meaningful, playful consciousness." The RaumZeitPiraten (Tobias Daemgen, Jan Ehlen, Moritz Ellerich) are a space and time bending artist group. Since 2007, they have been misusing and remixing ancient and up-to-date auditive and visual technologies for heterogeneous, organically improvised light and sound architectures. A RaumZeitPirat in his natural habitat | © RaumZeitPiraten Their activities are aimed at playful, experimental connections of sound, image, object, space and time to an alternately-self-expanding-multimedia-performance-surround-spaceship-laboratory-travel to somewhere between science and fiction. The RaumZeitPiraten perform internationally and their work has been rewarded numerous prizes and grants. We spoke with the artists during the construction of their installation on the occasion of Nuit Blanche 2019 at the Goethe-Institut Montreal. How did RaumZeitPiraten come into being and how did you come up with the name? The first project of RaumZeitPiraten was an analog daylight projector and a children's piano. Encouraged by this performance, we decided to further develop the idea. That was in August 2007. We are pirates because we travel through space and time, into unknown waters, entering public space. We make use of an interdisciplinary approach, it is, so to speak, a great raid by cultural technology. You speak in the self-description on your website of creating ephemeral, imperfect worlds. Don't you strive for perfection? Perfection has a big end in it; but it's the development, the imperfection that interests us. Accordingly, a project is never "finished". We are constantly evolving - even during an exhibition it is possible that we may still change details. Your works are created in different places. How do these influence your working process, but also the works themselves? The works are always built into the space, into existing structures. Not only are the lighting conditions always different, but also the possibilities to install something. We do not assemble the things invasively by hammering nails into the wall, but ask ourselves the question: Where is the nail, a pipe, what can we use? The space is decisive and decides how the work will look. The final picture can therefore only develop on site. Of course we have an idea in mind, but it can change. That's why we spend a lot of time in the places where we work, but also just sit and watch. We don't distinguish between good and bad spaces, but view the process as dealing with situations. Playing with what is there informs our aesthetic decision-making process. Working in outdoor spaces - when we move around in urban space with mobile installations - is particularly interesting for us. Of course, you come across many more unknown things that challenge us. This step from the interior to the exterior was very exciting. Our installations are specially designed to be mobile, for example we have primed repurposed "Hackenporsche", i.e. shopping trolleys, with which we flooded the space for a fleeting moment. What about the materials - do you consciously introduce uncertainties into the processes through the use of analogue materiality? Absolutely. Here we collected materials that have fallen at our feet at Mount Royal. We always unsettle ourselves with how we deal with the use of materials. What the machines do, show and reveal is a mixture of organic and inorganic material that is brought together. It is always the imperfect, fragile, overlooked and thrown away and then found again. This can unsettle us, but in the end it also shows us that it is precisely this momentum that is at stake. The use of our materials has, of course, changed. Nevertheless, we can imagine that people who got to know us in 2007, 2008 would recognize our work now. There are materials that we have carried with us for many years and this collection expands every time. The fact that we then reuse the materials in the next installation also creates a kind of connection between the places. The names of your projects often have rather bulky names, such as "OptoAkustisches ReiseKofferInstrumentarium". What is it all about? The title has a onomatopoeic sound, on the other hand it describes exactly what these suitcases can do at the end: You can travel with them and when you unfold them you will find optoacoustic instruments. In this respect, all this brings everything together and there is also an affinity for long, bumpy words behind it. Some translations work, but on the other hand we also like to be active abroad with bumpy German titles. Onomatopoeic language comes to the fore and creates imaginative spaces. Do the reactions to your projects abroad differ from those in Germany? Of course, communication abroad is more often different, sometimes more limited. However, we notice much more clearly abroad that there are different perceptions of public space and we experience how people behave in public space. How do people in their different cultures deal with public space? In Tunis, for example, we were positively surprised by the lively cooperation of the people. Of course, political factors also play a role, and we were generally able to perceive a sense of optimism among the young people there. The interview was conducted by Hanna Lange, from January to May 2019 intern at the departments culture and information at the Goethe-Institut Montreal. Copyright: Text: Goethe-Institut Montreal. This work is licensed under a Creative Commons Attribution – Share Alike 3.0 Germany license.